Video marketing isn't complicated. As a landscaper, interior contractor, mason, or home builder, all you have to do is take a video of a completed project and make it available to your target market. It doesn't take long to gather an entire portfolio of completed projects. Many contractors chose to make each video a before and after presentation. The great thing about video marketing is that you can use it for more than showing off videos of your work. On the same video that shows the before and after stages of different projects, you can also feature an interview with the property owner during which time they can talk about why they chose you and why they think you're the best contractor in the area. These types of interviews instill trust in potential clients, increasing the likelihood of them hiring you for future projects and giving you referrals to family and friends. You can also ask your clients to post the video on their website or social media accounts. There are a number of different ways you can capture videos of your completed projects. 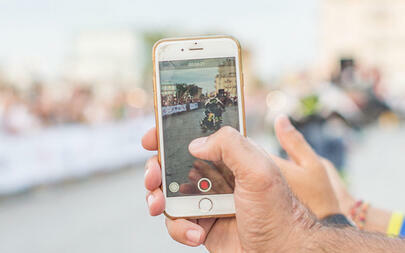 A surprising number of contractors simply use their smartphones to take the videos. Once they've captured what they want potential customers to see, they simply upload the video their favorite social media sites. This is fast and efficient, but the cell phone videos sometimes lack professional polish. For a really polished video, you can't go wrong with a professional video company. Not only does the company have the high-quality equipment and experience needed to get a really great video of your project, but they also know how to edit the footage together to create a truly stunning piece of work. A professional video company is particularly useful if you want a video marketing project that shows before and after shots, as well as some video of the work-in-progress. Drones have been especially effective for taking great aerial videos of landscaping projects. Just make sure that the drone is equipped with a high-quality camera and is piloted by someone with a great deal of experience and is familiar with the local laws regarding the use of drones. Once you've taken a few videos that showcase your work, you're going to find that video marketing isn't just effective, it's also lots of fun!